Next week I am officially starting my new job, which I am excited about! So, I'll report a few things before life starts getting even busier. When I was offered my job, it became a little clearer: all you have to do is pick a health insurer and they will give you a letter to pass to your employer. Then the insurance comes out of your monthly pay. I chose AOK just because it was close by, and was really happy with their service. Since I may come into contact with food during my work, I also had to acquire a Gesundheitspass. This involved travelling to a centre in Wedding (no appointment necessary), paying 20€ and watching a 30-minute video with about eight other people. It was essentially all about common sense, but I am now the proud holder of a health and safety certificate - my first German qualification. This week, my parents came to visit! It was really nice, but strange to show them my new turf. We went to the Wall Memorial at Bernauer Straße. Tall, rusty poles indicate where the Wall ran along this street, between the French and Soviet sectors. It serves as a sort of outside museum - you walk within the no-man's-land, reading about the people who dug tunnels to escape, or had their houses demolished to make way for it to be constructed. The stories are terribly sad and make you think to yourself over and over again: what was it all for? While other Wall sites around Berlin focus on reunification - like the East Side Gallery - this is all about the human experience during this oppressive time. We also visited the parliament building, which I had never actually done, despite having visited Berlin multiple times before moving here. It's just a case of booking a visit in advance online, and it's free. It was a stunning experience, especially since we went at night. It'd be nice to get some views of the city in daylight too, one day, so I will definitely go back. This week I discovered that beds - the comfiest thing in the world! - can be a source of stress in Germany. Square pillows I can cope with, but buying new stuff for your bed can be a nightmare if you haven't done your research. My bed consists of two single mattresses pushed together. Apparently, this is quite common here, along with two separate duvets, even for couples living together. I have no idea whether this is for duvet-hogging prevention, or what. Anyway, the stuff on offer in shops therefore appears to be mostly for single beds. I can sum up the German bed conventions by the sizes that IKEA offers: Normalgröße (140x200cm - single), Comfortgröße (155x200cm - slightly larger than a single) and Übergröße (240x220cm - double bed). It required trial and error, but I've determined that an Übergröße sheet and a Comfortgröße duvet cover are optimal for my situation. Finally, I seem to have made it a weekly habit to go to Two Planets and get a bagel covered with melted PB&J. My fab illustrator friend Katie has a studio in Neukölln where I have been to write a couple of times, making it terribly convenient to visit this bagel shop. The other vegan fare includes freshly baked peanut butter cookies and granola bars. I do wish that non-dairy cream cheese was on offer, but for now, I'm very happy with this heavenly combo. I have been holding off from publishing any more posts - even though I have so much to talk about - because I wanted to wait until I had some steady ground under my feet. There are some things you don't really want to document on the internet as you go along. I get self-conscious that readers might perceive me as floating around the city all day with my greatest hardship being deciding where I'll go for coffee, when the reality is the opposite. I'll make a specific post about it when I'm ready, but for now, I'd like to introduce you to my neighbourhood. You may have only heard of Prenzlauer Berg from the Beirut song. Luckily, I'm here to help you put a face to the name. Forming part of the greater borough of Pankow in north-east Berlin, Prenzlauer Berg has become typically one of the more expensive neighbourhoods in the city, but I'm paying a pretty decent rent price given the amenities. I am absolutely spoilt for choice when it comes to cafés, restaurants and shops. The area is also very well connected; I can get into Mitte, Friedrichshain and Wedding without much bother at all. Parts of Prenzlauer Berg are quite popular with h*pst*rs (can we have a moratorium on this word? ), but it's also got a reputation as being rife with upper-middle-class families. I guess that since parts of it are so kid-friendly, in some ways it cancels out the light pressure that you sometimes feel from people your own age. I guess I am trying to say that I feel welcome here and I don't feel like I have to put on airs when I leave the house. The main adjective I would apply to Prenzlauer Berg is "laid-back". Yes, this is a word that people tend to associate with Berlin in and of itself, but I find that it's particularly the case with this area. Whenever the train emerges from the U2 tunnel into the daylight, approaching Eberswalder Straße station, I feel this wave of calm wash over me. My new love is the tram, whose lines, I believe, only run through the former SED-ruled Berlin. Before, I always joked that I don't trust trams and buses because you don't really know what you're getting or whether you'll actually be on time, because of traffic. But I do like how on a tram, you can actually see your surroundings. It brings back fond memories of living in Linz, too (the tram is known as die Bim in Austria). I have made it my mission to try all the ice cream parlours in the area before they close for the winter months. At 1€ a scoop, how can I resist? Most of them offer sorbets - even chocolate sorbet, which I didn't think was possible before I came to Berlin - making them very vegan-friendly. My favourites? Das Spielzimmer, Naschkatze and Süße Sünde. While Kreuzberg and Neukölln are home to a significant Turkish population, you see very few Turkish businesses around Prenzlauer Berg. Vietnamese Berliners are based largely around Prenzlauer Berg (for historical reasons, which you can read about in this article). So, I've had the chance to try some Vietnamese food for basically the first time. Chay Asia is an all-vegan maki/sushi place that really surprised me; sushi isn't something I ever crave, but sitting outside on a not-too-noisy-not-too-quiet street on a Friday evening, while sampling sharp new flavours, hit the spot. That's right, I am finally registered as a resident of Berlin. After two failed attempts (note: don't put your moving-in date as a future date), I guess you could say it had become the bane of my life; being technically still a tourist prevents you from doing quite a lot. After the opening time itself, I waited another 30 minutes or so to get an appointment number. It was set for three hours later, and some people I'd met in the queue - Humboldt students from Ireland, Bulgaria and Mexico - invited me back to their place for lunch! 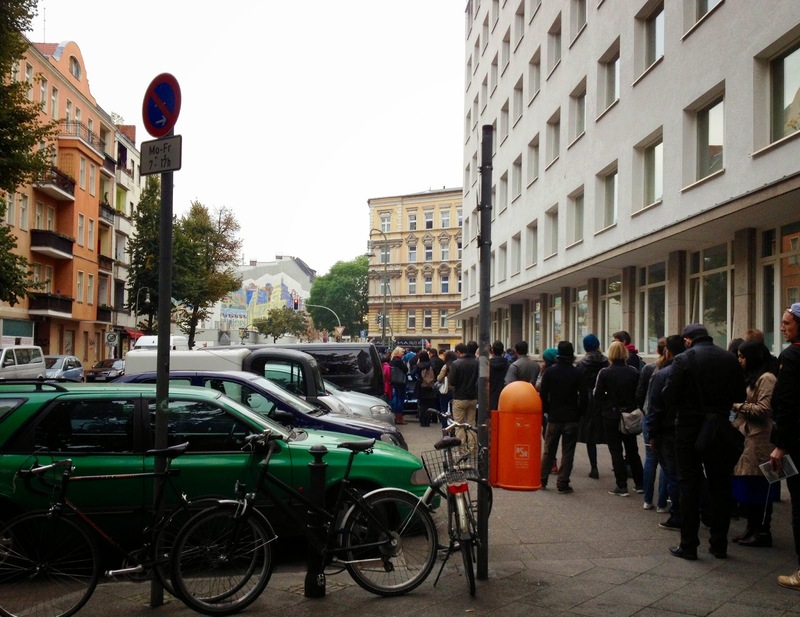 We got back to Rathaus Neukölln and sat in the waiting room, where numbers appeared on a screen. When I went up to the desk, the person I spoke with was very friendly and even complimented me on my name! Despite the frustrations I have had to go through in order to even get an appointment, the procedure itself only took five minutes. I just had to show my passport and a form I'd happened to have previously filled out (and had asked my housemate to countersign). You may need to take a flat/WG contract with you, though, and I'm only speaking as a citizen of an EU state. So, all because of a piece of paper, I'm feeling a little more settled in. Looking forward to joining the library and receiving my tax card! Recently, I've been feeling very much as if I'm in a waiting room. The past week or two has been filled with panic and socio-cultural misunderstandings, and I haven't exactly been feeling my best. So, I thought it would be nice to take a look at the people I've met and the food I've enjoyed recently. And a lot of this has happened to take place in Neukölln - specifically in the areas around Sonnenallee (former East/West intersection and also a hilariously styled film) and Karl-Marx-Straße (the name speaks for itself). First off, I met up with Natalye, a writer who settled here a few years ago from California. She showed me Sfizy, Europe's first all-vegan pizzeria. I had a Hawaiian "chicken" (tempeh) pizza, which was great. Sfizy offers a lot of different Italian dishes, including calzones, which I am excited to try someday. After that, she took me to the Schillerkiez, a small neighbourhood at the westernmost end of Werbellinstraße. We got delicious sorbets from Mos Eisley and took a short walk to Tempelhofer Freiheit, Berlin's resident airport-turned-park, where the sun was just setting. When I finally visited Tempelhof, I still found it hard to believe that someone once thought it would be a brilliant idea to put an airport in the middle of a city, that an airport could be on your doorstep. But once you're there, you realise what a very special place it is. The field is massive - apparently it takes 45 minutes to walk from one end to the other. There's a fenced off area for dogs to play in. There is a cute allotment area. People are riding bikes and doing all sorts of sports on the still-intact runways. It's also historically significant, of course, as it is where the Airlift took place (when the Allied superpowers flew in supplies to West Berlin during a Soviet blockade). Even when I pass it on its southern edge on the Ringbahn, with the Fernsehturm in the distance, I feel this sudden jolt, like this is the spirit of Berlin. By the serendipity that is already characterising my life here, I came across someone with whom I had three mutual friends - Becca! We both went to the same university, but didn't know each other then. She is now working as a chef here and is passionate about arts in mental health. We checked out Café Vux, a vegan Brazilian-themed café. One remarkable thing about Vux is that it is great to sit outside. The cobbled street - which had recently been rained on - is very quiet, and actually reminded me a little of England, what with its church and a view of a "high street" in the distance. It was an oasis just off the edge of urbanity. We also popped into Dr Pogo. It's a small vegan co-op whose stock includes cola bottle sweets. I don't know how often I'll go back and support it as I am not living close by, but if I'm in the area I will be sure to check it out again. Today I moved into my new place, which I will of course make a post about in the near future. There are a couple of other factors in the making that are signifying new beginnings. Bring on October!